POOR Bertie Ahern. Once he was everybody’s favourite. He liked a pint, he liked going to Croke Park, he liked Man United, he was open about living with a woman who wasn’t his wife, he kept the unions on-side, he presided over boom times, he wasn’t Charlie Haughey. A dream of a taoiseach. Then the economic roof fell in and smiles turned to yells of rage. God knows Bertie hasn’t helped himself. He did a daft TV commercial where he was stuck in a cupboard (it doesn’t matter WHY he was there, just pay attention) and he’s been drawing a huge pension – €150,000 and €265,000 in “secretarial expenses” – over the past three years. Now he’s capped it all by saying that during his term in office the people in the south “went mad about house-buying”. One paper even added to its headline ‘sneers Bertie’. What a plonker! Pointing the finger at other people when everyone knows he was the one that brought the southern state to its knees. Take that, Ahern, the southern media screamed all last weekend. And that and that. You gurrier. 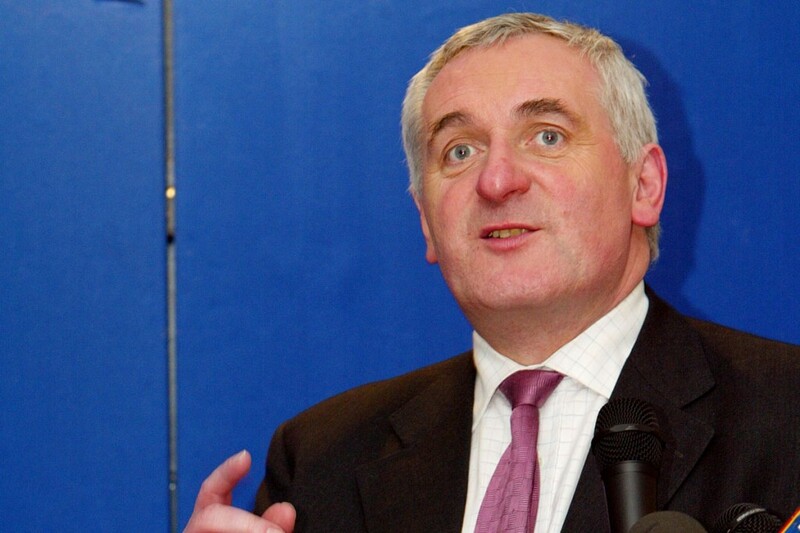 Hey – newsflash: Bertie is a politician. It’s his job to look good and, if necessary, shift the blame. When’s the last time you saw a politician come out and say, “I made a right pig’s posterior of that one”? Doesn’t happen. Not in their nature. So it’s a bit unfair to pick out old Bertie for such a thorough kicking. Although – and this is the interesting bit – the kicking was invariably modified by “Of course we do owe him a lot for delivering the peace process”. Eh? We know Bertie’s mother died during the final negotiations in the North. And we know he drove or got himself driven up to Stormont to carry on with the work. But he “delivered the peace process”? The media, particularly in the South, are a funny lot. They lock on to a version of events and you couldn’t shift it with a bulldozer, even when it’s crashingly clear that the version is off-beam. The truth is, the Good Friday Agreement came about for one major reason: because the IRA called a ceasefire. And if you then ask “Who was it persuaded the IRA to call a ceasefire?” the answer is not Bertie Ahern, that’s for sure. One person was central to the IRA ceasefire which made possible the creation of the Good Friday Agreement – to which, yes, of course, others, including Bertie, contributed. Who was that one person? Gerry Adams. But the southern media find that very hard to say. The peace process? Um, Bertie Ahern. Oh, yes, and Albert Reynolds. And of course Tony Blair – key figure, Blair. And Ian Paisley – mustn’t forget the big man. Then there’s Bill Clinton, crucial, really crucial. And that guy who used to have a beard, shaved it since – yes, Niall O’Dowd. And that’s about it. Apart from John Hume, of course. Trojan work, Hume. Let’s leave it there, shall we?…What’s that? Gerry who? Don’t know why you bring him up. Apart from denying he was in the IRA, can’t see what he did to bring the peace process into being. Anyway, we don’t like using his name around here. In fact, to be safe, we don’t use ANY words that begin with a G or an A. The South’s media are very keen on moral judgments. Drunk driving, sexual abuse, racism, corrupt developers – they’ll point the finger and name the names, all the while erasing or attempting to erase facts or contributions that don’t fit their version of history. Maybe spend less time kicking Bertie, guys, and a little more looking in the mirror.